Would you like to work at Vesper Hills? Check this page periodically for job openings! If you would like to fill out our employment application Click Here to download and print! You may either email, mail, or drop off completed applications! Vesper Hills Golf Club works hard to ensure you have a great time here! We continue to make improvements to the clubhouse, restaurant, and golf course for your enjoyment. 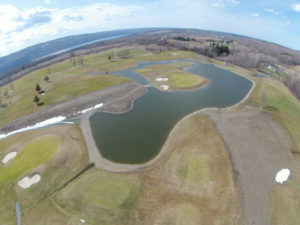 Check out the eighth hole and pond featuring one of the few island greens in New York State! We look forward to seeing you! Enjoy fine dining in a casual atmosphere at The Loft Restaurant and Sports Bar at Vesper Hills! READ about us, or view our weekend SPECIALS by clicking on these links. Check out our list of Member Tournaments. Just click on the "MEMBERSHIP" tab above.